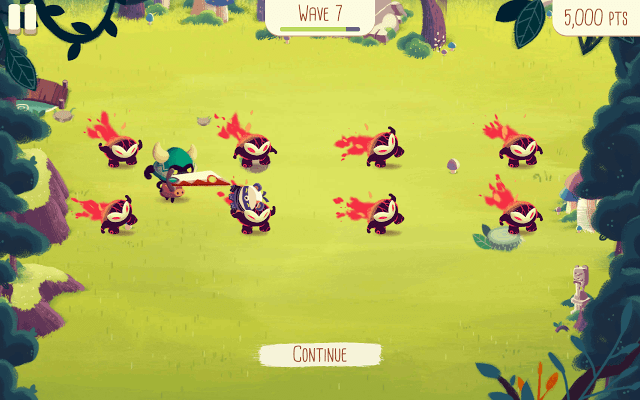 Spryfox’s Bushido Bear is an excellent slasher that lets you control cute sword-wielding bears as they try their best to use their Katanas to keep monsters at bay. You will have to drag your finger close to your enemies to slice them to pieces. There are several cute teddies, each having a unique ability that will help you defeat hordes of incoming monsters. 2. Enemies won’t appear in a set pattern most of the times, so expect them to appear randomly at any area. Common enemies like the ones shown in the above screenshots usually appear in certain patterns. Just make sure you are not drawing shapes too close to your enemies. Move away from your enemies first and then draw shapes. Also, keep an eye on enemy summoning circles. 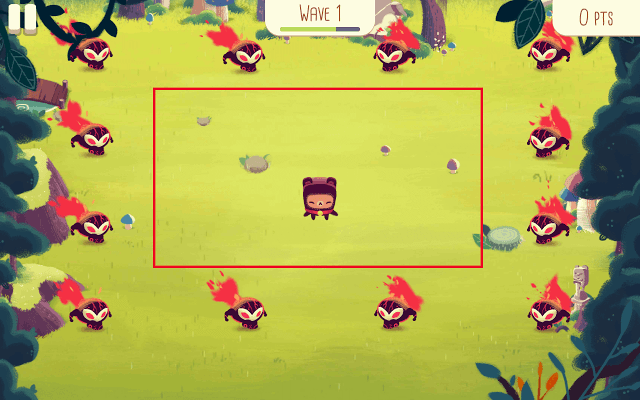 Move your bear away from those circles when they appear on the ground. They can appear anywhere, so to be safe try to move your character to the middle of the ground soon after defeating one set of enemies. This is usually a safe spot, although enemies may also appear in the middle sometimes. 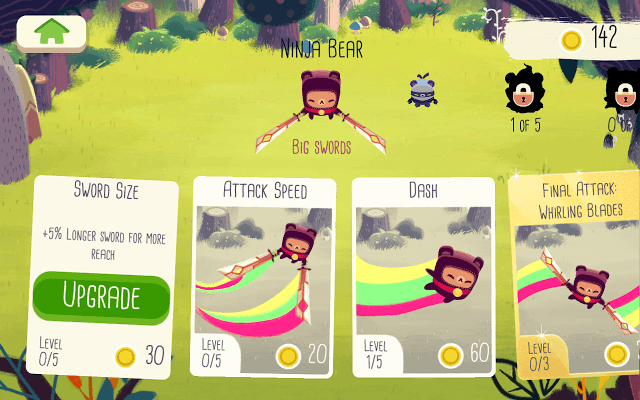 A Ninja bear will be equipped with bigger swords, whereas a Lone cub will be slow-moving but won’t be easy to hit. Meaty bear has some awesome giant swords, but he just can’t carry the load and hence moves slow. Zombie bear will be brought back from the dead after being defeated for the first time in a play session. Smoky bear does not dash, instead it just teleports himself to the desired location. Thief bear can be very useful to capture bonus loot quickly before they vanish in thin air. Bullet Proof Bear can be very useful against rocket-launching enemies. The projectiles will deflect off his body. Neo bear already has the slo-mo power-up. Time slows down when you draw a path, making it easy for you to take out max enemies in one move. 4. While slashing incoming enemies, take a look at the wave bar at the top of the screen. The bar keeps decreasing until it turns red and finally reaches the end. 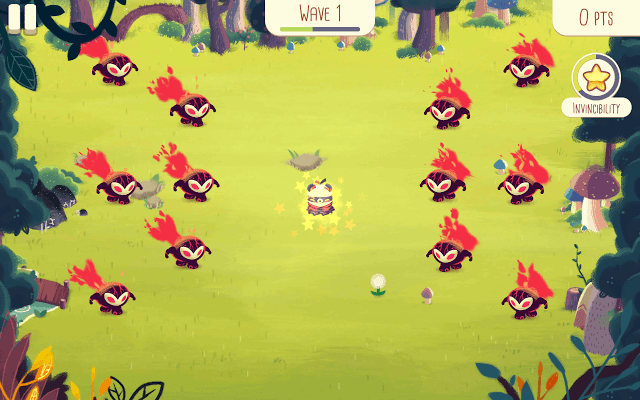 Try to eliminate all incoming enemies before the wave bar gets empty. New wave of enemies will appear soon after it reaches the end. It will be difficult for you hacking and slashing the current lot as well as new enemies, so make sure you kill all of them before a new wave starts. 5. Knights run from one corner to the other and so the best way to take them out is to draw a horizontal line if they are moving horizontally or a vertical line if they are moving vertically. Just don’t come in the middle of a charging knight touch him. 6. Take out rocket launching monsters as quickly as possible; they can be a big nuisance if not taken out early. Slash them before they fire rockets towards your character. 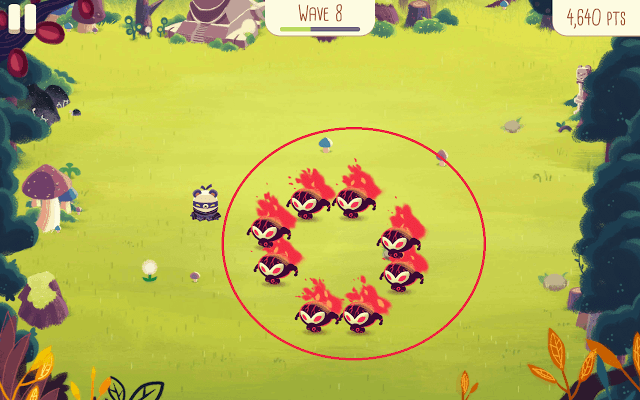 You may quickly draw a line or shape to destroy them when they appear out of their summoning circles. Just don’t give them a chance to fire rockets. Beware of ballerina monsters and try to kill them before they turn hostile and dart quickly from one corner to the other. 7. Moles can be extremely frustrating to deal with, but once you know the trick to get rid of them, you will have a fun time whacking them with swords. Your bear won’t be harmed in any way when a mole in a hole travels from once area to other. Just make sure you move out of their way when they stop. This is when they pop their heads up. Take them out when they stop and put their heads up above the ground. When they pop up from their burrows, they will look around for a few seconds, which is enough time for you to get rid of them. 8. Pay attention to your quests. Spryfox offers a unique way to challenge players. In Alphabear, players were greeted with new set of challenges daily. In Bushido Bear, new set of quests will appear every day. Once you complete all three quests, you will be rewarded coins, tokens for unlocking better badder bears, colorful and bright sword trails. You have to collect a certain number of tokens to unlock a new bear or a new trail. Try to complete all objectives on the same day. New challenges will pop up next day so keep completing them daily to get tokens and other rewards faster. 9. Upgrade! Upgrade! Upgrade! Tap Dojo to upgrade your skills. Level up sword size first and then attack speed because these two skills will help you survive longer. Larger the sword sizes, easier it will be for you to slash enemies from a distance. 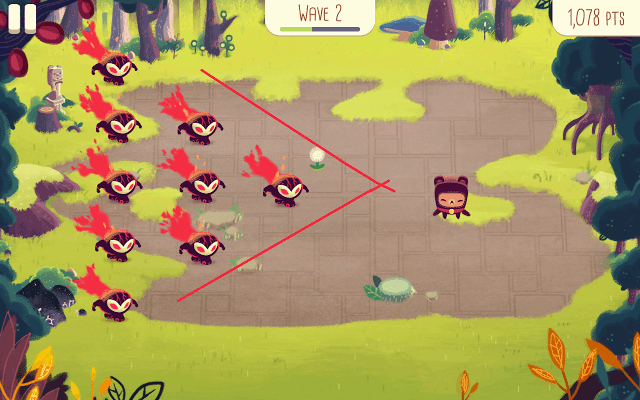 An upgraded Attack Speed will help your adorable bear move and slash faster. Also don’t forget to activate “Whirling Blades” as this skill will allow your character to hit more than one enemy in a single attack. 10. When your bear gets defeated in battle, a new unlocked bear appears on the battleground and becomes invincible for a few seconds. Take maximum advantage of his invincibility and slash down as many enemies as you want. But keep an eye on the “Invincibility” meter to your right. Stop wildly slashing around when you see the meter reaching the end.